I’m truly thankful for my teachers who have taken the time to show me proper alignment. It’s something I still work on, because it’s a lifetime endeavor to be sure. As an ICU nurse, I firmly believe in protecting our bodies—we only have one and we put it through a lot! As a yoga teacher in training, I believe alignment brings incredible power to each pose. 1. Enter from Warrior II (traditionally) by straighten your legs. Flip back thumb up. 2. Shift back hip out, slide front hand forward in a line. KEEP BACK LONG, try not to let it collapse. This takes a great deal of core strength! You can do it! 3. Flip one hand up in the air, the other down to your feet. It’s less important to touch the floor or the toe than it is to keep good form and get a proper stretch. Good alignment will prevent injury, and build flexibility and strength quicker. And that’s it! Easier said than done, I know. But these are some of the tips that I am currently working on each time I hit the mat, so I wanted to share them with you. 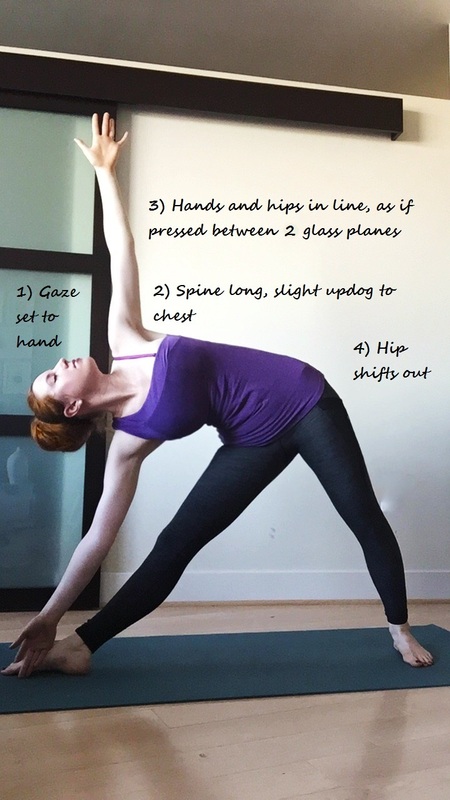 If you are brand new to this pose, please check out this amazing Yoga Journal video. Hope you’re having a lovely week! Much love and namaste!